To support their individual state in the advocacy of the Federal Bill HR 632 by setting a meeting with their US Senators and Congressional leaders to promote passing of the legislation through the US Senate. To interact and communicate with other parents of missing adults and family members, provide them support and resources in their time of need. To promote the action of building a grassroots base of volunteers and supporters in each state to bring awareness of missing adults. To build a charitable base of donors and contributions by interacting with other community entities such as churches and other institution, social services, corporations, other community and faith based organizations. To assist in the organization of a planned trip to Washington DC in July or August of 2009 and conduct a meeting with US Senators in promoting HR632 and support of the legislation. Provide your Name, Address, Phone or Email address and their volunteers will contact you. If you tweet, please show your support by following the National Center for Missing Adults at @NCMissingAdullts. Justice Interrupted Show featuring Lilly Aramburo’s case has been scheduled for Tuesday, Sept 9, 2008 at 10:10 PM Central Standard Time or 11:10 Eastern Standard Time (whatever your time zone) Please call in with your questions. I hope you are able to listen. I’ll be updating you all with the most current info about her case. We have created a new Lilly Aramburo Milk Carton. I urge all families with a missing loved one to use this free service. My Milk Carton is a free resource that allows you to create a milk carton for your missing loved one. It’s very easy to use, all you need to do is register for your free account, submit the information and pictures about the missing person in the form provided and you’re all set. The pictures must be smaller than 2MB in size to upload. It takes between 24-48 hours. Using a milk carton to aid in your search is a playful and catchy way to get serious attention and have your missing person noticed. I have to share this very insightful article written by David Van Norman, a San Bernardino County deputy coroner’s investigator. It is entitled “WHAT EVERY FAMILY MUST KNOW”. Everyone that has a missing loved one, should take a moment to read this. It’s very valuable information coming from a man whose life mission is to “teach families to submit samples to be tested for DNA — such as a toothbrush or T-shirt — when they report someone missing.” Mr. Van Norman deserves praise for his dedication. Here is a must watch video about his work in San Bernadino County. When a loved one is reported missing there is every right to expect that some large law enforcement investigative machine trundles into action; police fan out in all directions, and the search is on for the missing person. I am sorry to say that nothing can be further from the truth! In the real world missing-person detectives are overwhelmed by the shear volume of missing persons cases and a plethora of other investigative duties, including investigating rapes, assaults, burglaries, etc. Most detectives receive no special training in missing persons investigation, which is unfortunate in light of the fact that the missing person assignment is like no other type of law enforcement duty – requiring an entirely different kind of focus and skill set. This is the reality. We can cry about it, or we understand what to do about it! Until federal and state legislation catches up and mandates every law enforcement agency in the country investigate missing person cases properly, it is up to you to make the right choices and ensure that what must be done, is done correctly. We must ensure that if a loved one is missing that we put everything into play that will ensure that they are detected when they appear on law enforcement’s radar. We must erect “Velcro Walls” in cyberspace; walls created from identifier records that relate to the missing person, and catch hold of corresponding identifier records for an unidentified person ANYWHERE in the United States (or beyond). The fact is that a vast majority of missing persons return on their own, without any intervention by law enforcement (which is another reason that some police officers are loath to dedicate time and resources to a missing person, particularly runaways – believing that 95% of the time they just come home anyway!). However, for that small percentage that do not return, we all know that they are on this planet somewhere, and that they are either actively hiding from us, need our help, or are ignorant of our search for them. It is estimated that there are over 40,000 unidentified persons under investigation across the US. This is a staggering number. Even more staggering is that only about 7,000 are being actively entered into the FBI’s NCIC (the National Crime Information Center)! Although most of the unidentified persons are deceased, it is estimated that as many as 30% to 40% are living. Some are unwilling to identify themselves; they are actively hiding from us. Some are unable to identify themselves; they are confused by Alzheimer’s, incapacitated by mental disability, or by injury – or they are dead. Whatever the reason, alive or not, how can it be that these persons have not been identified? 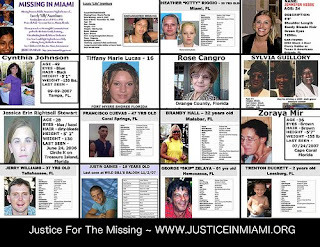 How many must be on the rolls of the 111,000 active long-term missing persons cases in the US? Forget what you saw on last night’s episode of CSI! There are only three scientifically-acceptable ways to identify someone who is either unwilling or unable to identify themselves: fingerprints, dental records, and DNA. Notice I did not mention photographs. It isn’t that photographs do not have their uses; statistically one in six missing persons returns home as a direct result of a photograph on a poster or a website. It is just that they do the unidentified person investigator no good. No competent investigator will swear in a court of law that a photograph matches a decedent – there are far too many post-mortem changes, and too many people appear similar. That mug-shot may be probable cause to stop a suspect, but that officer will next confirm the identity with fingerprints, or by some other means. Keep the photographs on the posters and websites, but the only type of imaging that is of any use to a forensic investigator is a “smiling” photograph depicting the missing person’s teeth, or a “talking” video, showing the missing person’s teeth. Those can be compared to an unidentified person’s teeth by a forensic dentist. Fingerprints, dental records, and DNA! These are the critical minimum records that must be submitted into law enforcement’s searchable databases. No wonder there are 40,000 unidentified persons! The first step is the most critical: The missing loved one MUST be reported missing to a law enforcement agency, and that agency MUST enter the record into NCIC (the National Crime Information Center). This must happen IMMEDIATELY. Federal law prohibits the establishment of a waiting period to report someone missing. I don’t care if the person was last seen walking out the door ten minutes ago- they are gone now! There is a “logic convention” in law enforcement that the person should be reported missing to the agency with jurisdiction over the place of residence. The reasoning seems to be that a person is likely to return to familiar locations, such as home. However, serious consideration should be given to the location that the person was last seen – particularly if the story is that the person was seen being bundled into the back seat of a blacked-out Mafia car! In California Penal Code 14205 is specific: “All local police and sheriffs’ departments shall accept any report of a missing person, including runaways, without delay and shall give priority to the handling of these reports over the handling of reports relating to crimes involving property… the reports shall be submitted within four hours after acceptance to NCIC via CLETS.” Technically that means that it doesn’t matter whether the person was never in California, and was last seen on the Space Shuttle! If the phone rings at a police station in California, and a person is missing, the report should be taken. It doesn’t matter if little Jenny has just run away for the 10th time – for all we know, this time she ran straight into the arms of Jack the Ripper! The family will encounter some typical law enforcement attitudes: “There is no law against being missing!” True, but there isn’t any law against taking the report – and in fact, at least in California, there is a law against NOT taking the report! “There is no evidence that anything bad has happened.” True, but absence of evidence is not evidence of absence! Since Jenny is missing we have no reason to believe she is safe, either. Unless the investigator believes that she is in the Penthouse Suite at the local Holiday Inn, eating bon-bons and sipping ice tea, then she is probably living on the streets with every scum-sucking ba***rd in society trolling like sharks for little girls just like her! Take the report and get the information broadcasting in NCIC! Nothing happens without the NCIC record. The NCIC computer chugs away all night long looking for matches between unidentified and missing person records. If a possible match is found between two records, a teletype is sent to both agencies. We receive approximately 1,500 of these match-ups per year for San Bernardino’s 250 long term unidentified person cases. It is then up to the agencies to compare the identifier records, IF they were collected. If one or the other record is not in NCIC, there IS NO WAY TO MATCH THEM TOGETHER! The missing person’s fingerprints may be located via a wide variety of sources, including (but not limited to): arrests, employment and background applications, military service, and even through check-cashing facilities and social services. If the missing person in California had ever applied for a driver’s license or identification card, a right thumbprint is available to law enforcement at the California Department of Motor Vehicles. The fingerprints (yes, even the single thumbprint) should be “registered” (not just “run”) into Automated Fingerprint Identification System (AFIS – State) AND the Integrated Fingerprint Identification System (IAFIS – FBI). Many investigators are under the impression that only criminal fingerprint records may be “registered” into AFIS. The fact is that AFIS is a database to be used for law enforcement purposes, and this is one of its purposes! IAFIS has a much more enlightened and progressive attitude. Fingerprints can be submitted by mail (after submission to AFIS) to the FBI, CJIS Division, in Clarksburg, WV, or by FAX. IAFIS is broken into regions across the United States, each with a regional coordinator (information available on-line at http://www.fbi.gov/hq/cjisd/iafis.htm). Family members should assist the missing person investigator by locating any possible fingerprints sources, and assisting in getting these submitted. These records are perishable, and MUST be obtained as soon as possible! California dental and medical providers are only required to maintain these records for 7 years. This sounds like a long time, unless you consider that the missing person may have not seen a dentist for five years, disappeared two years ago, and may not be found for another ten years. Lock down the records NOW! These dental characteristics are critical for the quick comparisons and rule-outs by a trained unidentified person investigator by comparing which of the missing person’s teeth have modifications (fillings or other dental work) with the deceased person’s (or unidentified living person’s) teeth. For example, if a missing person has a filling in tooth number 14, and the same tooth for the unidentified person has never been modified – it is a rule out: teeth don’t heal. These dental records (charts and X-rays)should also be entered into The National Dental Image Repository (NDIR), which is available to law enforcement through the FBI’s LEO network (Law Enforcement On-line). The NCIC record should be modified to state the following: “DENTAL X-RAYS AND CHARTS AVAILABLE ON NDIR.” The Unidentified Persons Investigator wouldn’t even need to contact the missing person investigating agency to check the dental X-rays directly. The best source of a missing person’s DNA is from the missing person himself (or herself) – referred to as a “direct” DNA sample. Missing persons leave their DNA behind on toothbrushes, shaving razors, hairbrushes, finger and toenail clippings, unwashed clothing, hats, chewing gum, etc. Use your imagination. If these items were not left behind (and even if they were), “reference” DNA samples should be obtained from blood relatives. The best “reference DNA” would come from the missing person’s identical twin siblings or both biological parents. If one parent is not available, then the available parent (hopefully the mother, because it is the mother that passes down mtDNA) should be sampled, along with as many full siblings as possible. The sampling procedure is simple; basically a q-tip is swabbed on the inside of the subject’s mouth. But, the sample should not be submitted to just any DNA lab. Since our goal is to have the missing person’s DNA profile to be available for comparison to unidentified persons nationwide, the samples must be entered into the Combined DNA Index System (CODIS – FBI). There are only a few DNA labs certified to complete a DNA profile and submit to CODIS (a list of such labs are available on the CODIS website). California has one: Department of Justice, Missing/Unidentified Persons DNA Program (DOJ-DNA). They accept personal items (toothbrushes, etc.) and buccal swabs. If the missing person was reported to a California law enforcement agency, then regardless of where the missing person’s family member is located, the agency should contact California DOJ and request that the free kits be mailed to the investigator. If the missing person was reported to a law enforcement agency in a state that does not have its own certified lab, then DNA samples may be submitted to either the Federal Bureau of Investigation directly, or to the Center for Human Identification at the University of North Texas(Phone: 800-763-3147). On average it will take a period of months for a missing person’s DNA profile to be developed and entered into CODIS. The NCIC record must be updated to describe the availability of a DNA sample in CODIS, including any reference numbers. After the identifiers have been entered into the searchable databases, I recommend that the family verify that the NCIC record has been updated. The NCIC’s position is that the NCIC teletype is for “Law Enforcement Use Only,” so many investigators will not show this printout to the family. I queried NCIC myself and was told that a copy of the NCIC may not be given to anyone, but that they have no objection to allowing the family to see record in order to verify its accuracy. I recently investigated an unidentified person case for which the identification was delayed 19 months because the Alaska State Police refused to take the missing person case for six months after the mother first reported that the 18 year old girl disappeared (a violation of Alaska State law), and then entered the Date of Last Contact as the date the missing person report was taken, rather than when the girl was last heard from. This effectively eliminated the chance that NCIC would match the two cases, because the girl is reportedly seen six months after she was dead in my Morgue! The 19 months that this mother suffered in fear, not knowing what had happened to her daughter, could have been prevented if the agency had taken the report (as required by law), and certainly shortened by a year had the family been allowed to review the contents of the NCIC record for accuracy. After all, the NCIC record is made up of information PROVIDED BY THE FAMILY. A missing person is too important to be left to one person. Those family members who wish to “leave it to the professionals,” and sit back on the couch to let the police do the work will probably get out of this what they put into it. I prefer the Team Approach, with the family involved in a productive way. We must help law enforcement to accomplish this mission, and if they do not know how, we can show them the way. Will law enforcement accept your assistance? Perhaps not willingly. We in law enforcement tend to think that we don’t need any help, and some investigators will view the family as hindrance. That’s too bad. The missing person is YOUR LOVED ONE. You may have to be insistent. You may ruffle some feathers. Is there anything more important? A Call to ACTION – Congress to discuss Kristen’s Act TODAY! Today July 15 at 2PM, Kristen’s Act is getting attention in congress. H.R. 423 would authorize the Attorney General to provide grants for organizations to find missing adults. Kristen’s Act Reauthorization of 2007- Directs the Attorney General, acting through the Director of the Bureau of Justice Assistance, to make grants to public agencies and/or nonprofit private organizations to: (1) maintain a national resource center and information clearinghouse for missing and unidentified adults; (2) maintain a national, interconnected database for tracking missing adults who are determined by law enforcement to be endangered due to age, diminished mental capacity, or the circumstances of disappearance, when foul play is suspected or circumstances are unknown; (3) coordinate public and private programs that locate or recover missing adults or reunite missing adults with their families; (4) provide assistance and training to law enforcement agencies, State and local governments, elements of the criminal justice system, nonprofit organizations, and individuals in the prevention, investigation, prosecution, and treatment of cases involving missing adults; (5) provide assistance to families in locating and recovering missing adults; and (6) assist in public notification and victim advocacy related to missing adults. Directs the Attorney General, through the Director, to: (1) coordinate Government-funded programs relating to missing adults; and (2) provide the public agencies or nonprofit private organizations receiving grants to maintain a national resource center and information clearinghouse for missing and unidentified adults with access to the Federal Bureau of Investigation’s National Crime Information Center. Latest Major Action: 2/2/2007: Referred to House subcommittee. Status: Referred to the Subcommittee on Crime, Terrorism, and Homeland Security. The FBI recently released statistics for missing persons as of Dec 31, 2007. The report shows that of the roughly 100,000 missing persons cases being tracked by the FBI, ~48% are adults (See DOJ press release, http://www.fbi.gov/pressrel/pressrel08/ncic2007stats053008.htm and associated report) . The bill renewing funding for the National Center for Missing and Exploited Children [NCMEC] was signed by the President on June 3, 2008 (P.L. 110-240) but the companion bill renewing funding for the National Center for Missing Adults [NCMA] awaits action in the House Judiciary Committee. As of this writing, Rep Myrick’s bill has 24 cosponsors and no objections to the bill have been voiced. NCMA has provided essential service to both families and law enforcement agencies for 14 years and is endorsed by over 300 law enforcement agencies. They provided crucial infrastructure and resources in the location and identification of well over 13,000 adults in the national emergency of the Hurricane Katrina disaster. The cost of the Katrina effort wiped out the financial reserves of NCMA. HR 423 will restore the resources of an exemplary agency, allowing it to continue to provide a valuable public service. you to voice your support to the subcommittee before or during this time.